Occupational health and safety issues matter. Both the employer and employee have an interest in properly investigating and reporting workplace incidents. Safety does not just happen – it is a process of vigilance and adaptation. 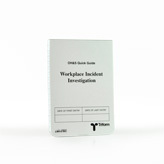 To meet industry needs Triform engaged Dilys Robertson, author of The Ontario Occupational Health & Safety Act – Quick Guide, to design these notebooks to be used as part of a coordinated, planned procedure to deal with accidents and incidents. For each provincial version of the notebook the policies and procedures described are in accordance with the legislation currently in force for that province: the Ontario Occupational Health And Safety Act: Quick Reference, the Alberta Occupational Health and Safety Act and British Columbia’s Workers Compensation Act, Part 3, Occupational Health and Safety. 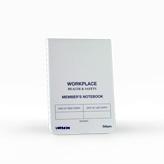 We can customize any sewn notebooks and a variety of carrying cases with custom content to meet your organization's need. You supply the content; we will take care of the rest. To find out more about the customization options, click here or contact us directly. To find out pricing on Triform products please try our Pricing Calculator, or contact a Triform Representative.